Within the past few days, we have seen an enormous magnitude 7.3 earthquake hit Venezuela and a giant magnitude 8.2 earthquake hit Fiji. Where will the next one strike? To many of us, it is becoming exceedingly clear that something very unusual is happening to our planet. I went and looked it up, and I was astounded to learn that the crust of the Earth has been shaken by 144 major earthquakes over the last 7 days, and that includes more than 50 on Sunday alone. And remember, these are not small earthquakes. 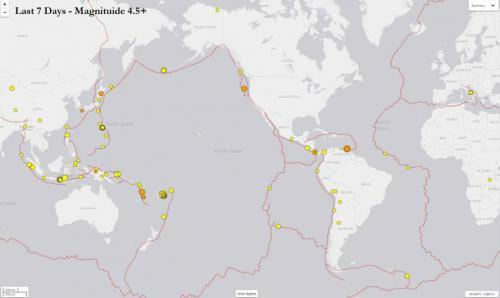 The USGS considers any earthquake that is at least magnitude 4.5 to be “significant”, and they are happening so rapidly right now that it is difficult to keep up with them. A major earthquake of magnitude 7.3 struck the northern coast of Venezuela on Tuesday and shook buildings as far away as the capital, Caracas, the U.S. Geological Survey said. The quake was centered near the town of Carupano, an area of poor fishing communities and was felt as far away as neighboring Colombia to the east and nearby island nations like Trinidad and Tobago, and St. Lucia, to the west and north. This is certainly the last thing that the people of Venezuela need at the moment. Their currency was just devalued again, and at this point it is so worthless that people are literally throwing it into dumpsters. “I feel like I’m about to faint. I’m shaking. It was long,” said telemarketing worker Sheny Fuentes, 22, speaking outside her work building in eastern Caracas. “I’m relieved that it doesn’t seem like damage was that bad. We would have been even more affected (given Venezuela’s economic crisis) – there are already people eating from the garbage and buildings aren’t well made,” she told Reuters. The other day I noted that the magnitude 8.2 quake that just hit Fiji was the second largest “deep focus” earthquake ever recorded, and this quake in Venezuela was highly unusual as well. And this earthquake came right on the heels of an extremely active 48 hours for global seismic activity. “Sixty nine major earthquakes have hit Earth’s most active geological disaster zone in the space of just 48 hours. 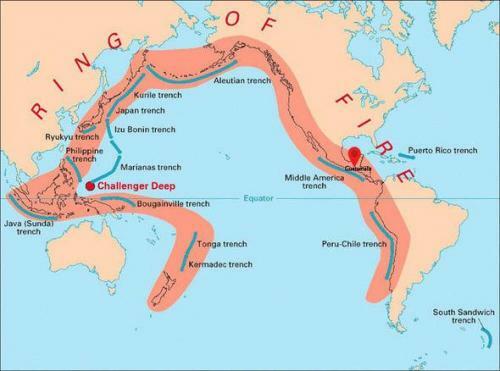 The vast majority of the earthquakes that shake our planet take place along the Ring of Fire. It roughly encircles the Pacific Ocean, and it runs right up the west coast of the United States. “The tremors have raised concerns that California’s ‘Big One’ – a destructive earthquake of magnitude 8 or greater – may be looming. “A number of earthquakes struck the region of Molise on the nights of August 15th and August 16th and the morning of August 17th. An earthquake was also felt in Le Marche near the port city of Ancona. But until major shaking starts happening in the continental United States, most Americans are not going to pay attention. It simply is not “normal” for 144 major earthquakes to happen in just one week. In addition, dozens of volcanoes are currently erupting all over the globe. We appear to have entered a time when the crust of our planet is going to become increasingly unstable, and it doesn’t take a genius to figure out that this is going to have very serious implications for the future of our society.